​​​​TEXAS - Only El Paso, Abilene and Wichita Falls had negative absorption for the quarter according to ALN Apartment Data 3Q 2016 Review. Even Midland-Odessa were able to absorb newly rented units. 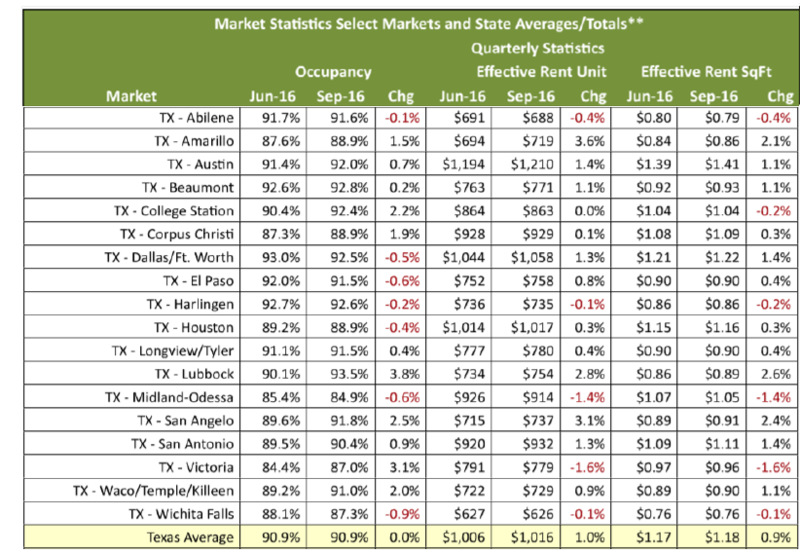 Austin, Houston and San Antonio had solid gains in absorption while Dallas-Fort Worth has seen its rapid absorption gains start to taper. Statewide, effective rents are up 1 percent from three months ago with San Angelo, Lubbock and Amarillo seeing rent gains in the 2-3 percent range over the quarter. ​Want ​more? Check out ALN's Monthly Review for your town from Abilene to Wichita Falls​!